In England during World War II, each dawn brought the sounds of young men headed off to war. 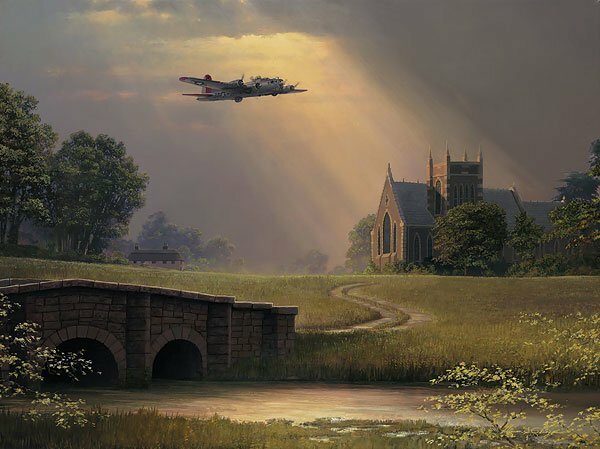 As daylight spreads across the tranquil countryside on this mist-shrouded summer morning, the aircraft of the 8th Air Force once again take to the air as they head for the dangerous skies of occupied Europe. Representing not only an overt symbol of Allied might, the B-17G is also a more subtle indication as to the direction of the war. The plane carries no camouflage paint, since paint added weight, which cost speed and fuel. Stationed in Northamsted between April '44 and June '45, this B-17G is from the 398th Bomb Group, 602nd Bomb Squadron. Along with most others, the crew members ardent prayer was ". . . give us this day."